25 Adhesive Colored Backgrounds for Instant Scrapbooking Fun! 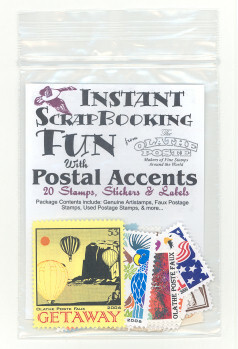 Highlight stamps, photos, or any other small items in your scrapbook with these colorful background accents. They're easy to apply! Simply apply moisture to activate the dry-gum adhesive on the back of the paper, position, and press. It's just that easy! Postal Accents Instant Backgrounds are great for embellishing any paper project. You'll even find other ideas and great uses for them listed on the back of the package. 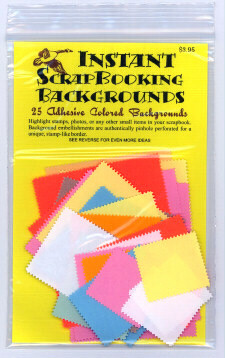 Background embellishments are authentically pinhole perforated for unique, stamp-like border. 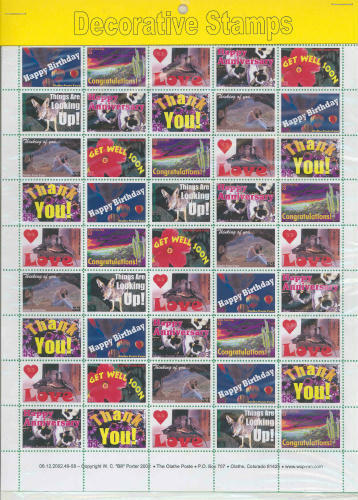 HERE'S A CREATIVE TIP: YOU CAN USE THESE BLANK BACKGROUNDS TO MAKE YOUR OWN FAUX POSTAGE STAMPS. JUST USE YOUR FAVORITE RUBBER STAMPS, MARKERS, OR PLENTY OF IMAGINATION! This product was added to our catalog on Monday 07 August, 2006.